Community Market Basket Recipes to Expand Your Taste Buds! Do you ever get an ingredient in your box that you have no idea what to do with it? Check out some recipes for these “not-so-common” produce items that have been featured in the Community Market Basket boxes so far! 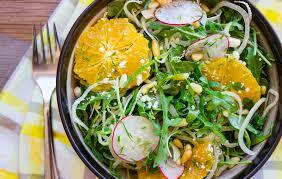 Combine the oranges, fennel, radish and dill in a bowl and toss with the lemon juice, olive oil and ¼ teaspoon salt. Set aside and marinate for 20 minutes, or up to an hour. When you are ready to serve the salad, put the Salanova in a large bowl. Add all the oranges, fennel and radish mixture, and pour most of the lemon juice dressing on top of that. Toss gently to combine. Taste and adjust with more of the dressing, olive oil, lemon juice or salt if needed. If you need to balance the tartness of the lemons, drizzle a little bit of honey on the salad at this point. Serve topped with pine nuts and feta. Toss kohlrabi with olive oil. Season with salt. Arrange in a single layer on a baking sheet lined with a nonstick mat. Bake at 250 degrees, rotating sheet, until crisp and deep golden, 35 minutes to 1 hour; transfer chips as they’re done to a paper-towel-lined plate. Season with salt. Preheat grill to medium high. Make a little bowl out of 2-3 layers of foil the size of half a grapefruit. 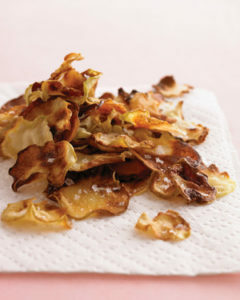 Place apple wood chips inside the foil bowl, and place it directly on the heating grill, close the grill lid. Make Relish: Place huckleberries in a medium bowl. Heat sugar ( or honey), vinegar, salt and coriander seeds in a small sauce pan and stir until sugar has dissolved. Add minced shallots and simmer two minutes. Pour over hot liquid over huckleberries, stir and set aside. You can make this ahead and refrigerate over night, or use right away. Brush both sides of salmon with olive oil and sprinkle with salt and pepper. Once apple wood chips begin smoking, turn heat down to low, grill salmon, skin side down, directly on the grill, on lowest heat, and sprinkle with zest of one lemon, and one tablespoon thyme leaves. Close lid. Check after 5 minutes. Shift salmon to create crosshatch marks on the skin, and close lid again for just a few minutes. Salmon at this point will cook quickly, especially if it’s a thinner piece. Once salmon is cooked to medium rare or medium, turn heat off. Using two extra large spatulas carefully place salmon on a platter over greens. Squeeze with the juice of half a lemon. 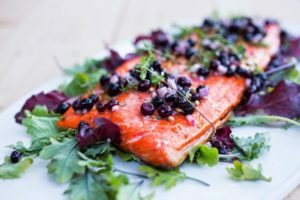 Generously spoon the pickled huckleberry relish and a little pickling liquid over the salmon and greens, and scatter with thyme sprigs. Serve immediately. pinch red chili flakes (optional). Slice or chop cucumbers. If the skin is too tough, peel the skin and if the seeds are too hard, remove the seeds. 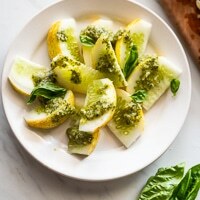 In food processor: combine basil leaves, parmesan, nuts, garlic, optional lemon juice, salt, and black pepper. While blending, gradually add the olive oil until the pesto reaches your desired consistency. Taste and adjust seasoning to personal preference and blend again if needed. If using traditional mortar and pestle: add basil leaves a few at a time with the garlic. Crush and grind the all the leaves and garlic until well combined. Add the nuts and cheese and continue combining into the basil mixture until a paste forms. Add the optional lemon juice, olive oil, salt and pepper. Stir and slightly grind until the everything is incorporated into the pesto. Taste the pesto and add additional salt/pepper to taste. If you want some spice, add a pinch of red chili flakes. Dress the pesto over cucumbers. Leftover pesto can be stored sealed and refrigerated overnight. Preheat oven to 350°F. Cut off top third of each squash, and scoop out pulp, using a serrated corer or melon baller, leaving a 1-inch shell intact. Coarsely chop pulp; reserve 1 cup of chopped pulp, and discard remaining pulp. 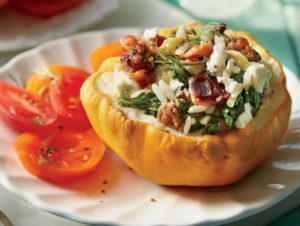 Place squash bowls in an 11- x 13-inch baking dish, and sprinkle with salt. Bake in preheated oven 10 minutes. Place bacon in a large nonstick skillet over medium-high, and cook, stirring occasionally, until starting to brown, about 5 minutes. Add beef to skillet, and cook, stirring to crumble, until starting to brown, about 6 minutes. Add onion, garlic, and reserved 1 cup chopped squash pulp to skillet, and cook, stirring occasionally, until tender, about 3 minutes. Stir in spinach; cover and cook until spinach is wilted, about 2 minutes. Uncover and cook until liquid is almost evaporated, about 1 minute. Transfer beef mixture to a medium bowl; cool 10 minutes. Stir eggs, cooked rice, pepper, and 3 tablespoons of the dill into beef mixture. Gently stir in cheese. Spoon mixture into baked squash bowls. Bake squash in preheated oven until tops begin to brown and squash is tender, about 30 minutes. Sprinkle squash with remaining 1 tablespoon dill. Melt the Earth Balance in a large, flat-bottomed skillet over medium-low heat. Smash each of the garlic cloves with the side of a broad knife and throw them into to melted vegan butter. Add in the olive oil and soften the garlic for about 10 minutes, stirring frequently to ensure it doesn’t burn. Once it is softened, remove the garlic from the skillet, but leave the remaining liquid. Increase the heat to medium and place the kale into the skillet and cover. Allow to slightly wilt for about 5-7 minutes, stirring occasionally. Remove from the heat and stir in the soy sauce. 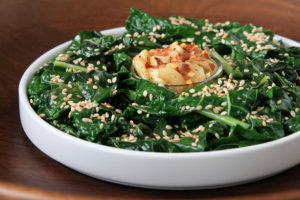 To serve, sprinkle with the softened garlic, sesame seeds and chili pepper flakes. Supported by United Way of the Midlands, No More Empty Pots is excited to continue to partner with Lone Tree Foods and The Nebraska Food Co-op to bring local produce weekly to Community Market Basket stakeholders. What do Dancing, Singing and Books Have to do With Apples? Talia McGill on Cooking at Home Comes With So Many Benefits- Here Are a Few! marcia kitrell on Cooking at Home Comes With So Many Benefits- Here Are a Few! No More Empty Pots’ vision is to support communities in becoming self-sufficient and food secure through collaboration, education, stewardship and sustainability. Our mission is to serve as a conduit, connecting individuals and groups to improve self-sufficiency of local urban and rural communities.